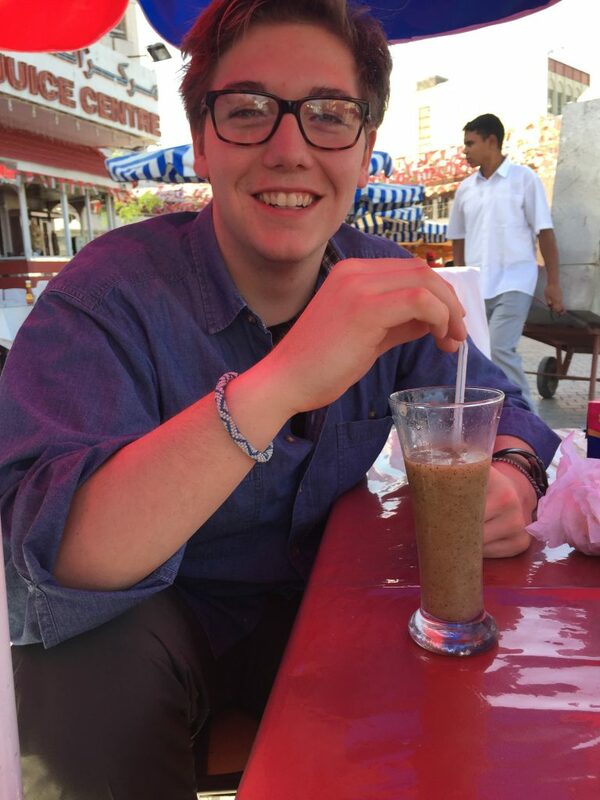 This is the first blog I’ve written that feels like an advertisement in a travel magazine or a television commercial for traveling to the Middle East. 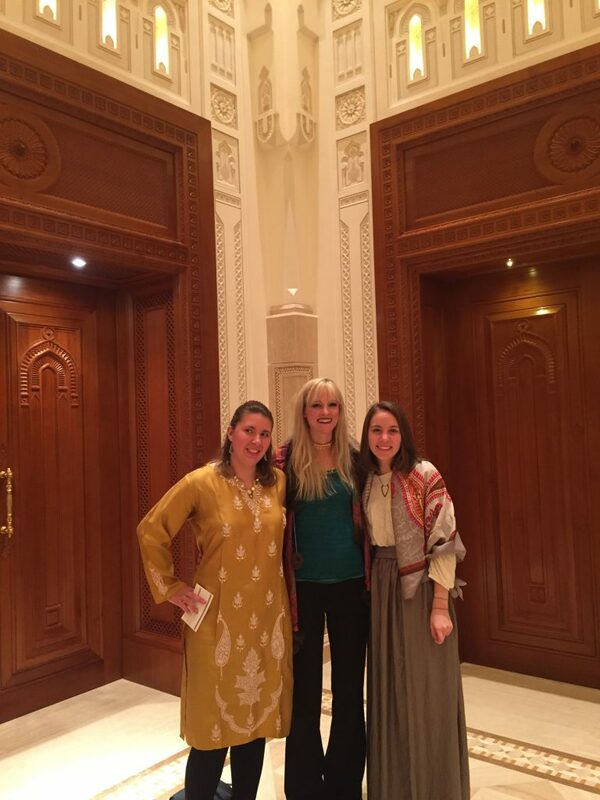 I felt like I was living a real life “Samantha Brown’s Passport to Oman” episode. When I was little, my mom would turn to the Travel Channel while we were dusting or sorting through papers together. Samantha Brown would flash her smile, crow’s feet flaring and hair blowing as she ventured through cities and towns pointing out incredible restaurants and historical castles. In my bedroom mirror, I would pretend I was the host of the show and make up adventures of my own: “Alley’s Passport to the World”! Today, I lived one of these real-life adventures. I snorkeled and swam with turtles, ventured out along the coast of Muscat on a dow (see photo above), and watched dolphins leap along the horizon. I felt like I was on the television screen in my living room…if only mom were with me. We started piling onto the boat at 8:30am, slipped off our sandals and claimed our seats before the Dow set off into the waves. Our Program Director, Justin, and his family invited us as well as another missionary family visiting from Bangladesh. Including our student party of six, there were fifteen energetic explorers, three talented crew members, and one Captain Said on deck. Each one with cheeks fit to be sun-kissed. I claimed a cushion and started snapping pictures, bobbing with the waves and concentrating on staying upright. About an hour in, the captain slowed the engine down and I heard one of the kiddos shouting “Look! Dolphins! Dolphins! Loooook!”. I knew there was a possibility of a dolphin sighting, but I didn’t think it would be so soon. Nonetheless, there they were, a pod of about thirty dolphins hopping through, chatting on their way like a family on a road trip. As they disappeared from view, we spun our boat the opposite way and continued toward our swimming destination. The usual Omani terrain of tall, rocky mountains loomed over every border of the harbor we pulled into. The sun reflected off the peaks and bounced back on the caps of the waves. Below the surface, collections of coral supported schools of fish and millions of other living creatures. The humans on board our boat, including myself were glistening with sweat due to the heat of the day. Thus, many of us immediately dove in as soon as the anchor was dropped. The water was a teal-green pigment with a flawless tepid temperature. I floated for a while, laughing with friends and squinting against the cloudless sky. As I moved my arms through the translucent sea, I didn’t realize that a creature was none too pleased to meet me. He left his mark on my lower left bicep and it tingled like a collection of static tickles on a fresh sheet out of the drier. The static soon turned into an irritating pierce on the surface of my skin. The invisible critter was a jellyfish and I had just been stung. Back on the deck of the boat, the sting swelled in three spots leaving harsh, red ridges where the jelly’s appendages had swiped. The captain suggested I pour cold water on my arm and let it calm down. It did settle and only hurt for about ten more minutes. I sat on the shaded deck and soaked in more rays watching kids splash in the water and giggling as my friends plastered snorkeling goggles to their faces and dove in with flippers flapping on their feet behind them. After chomping down a sandwich and some Oreos, I decided to give the water another shot. I grabbed my own set of flippers, a clear turquoise mask and bright yellow breathing tube and launched off the boat into the salty sea. I pumped through the waves, face flat in the water until I could find the reef. Always aware of the globs of jelly waiting, I hauled my body through the water until I found myself in the middle of a school of fish (the species of which I could not tell). Long, lanky eel-like critters mixed with blue and stripped, finned creatures and I witnessed their soiree silently from above. Without fail, water would seep into my goggles causing me to come up for air. On one occasion, I was thankful for the break to breathe as a couple floating on a boat nearby shouted and pointed where they spotted a sea turtle. I followed their arm and dove to the deep. It took a bit of twisting and turning to find the shell, but there she was! A stunning turtle gliding along the bottom of the ocean floor. It didn’t take long before I was choking on salt water again. But, seeing her was all I needed before heading back to the boat. Around 2:30pm, we departed back through the water toward the marina where the boat would dock until its next adventure. The Dow rocked back and forth, and mist lathered our cheeks occasionally while we watched the horizon. The scenery was even more picturesque than the Travel Network would show it to be. I may have a scar from the jellyfish, and way too much salt water in my system, but I still felt I was part of a trailer for a new travel film. So, any room for a co-host Samantha Brown? Jessica, Laurel, and I in our Opera attire posing before the show. When I packed for my adventure abroad, I went for the practical hiking clothes, clothes to cover up and the comfiest t-shirts I could find for lounging around our home. What I did not anticipate were the glittering gowns and long stunning skirts I would find venturing around the market. In the middle of this rocky desert landscape, there is so much glamour, and I have found the center of it all: The Royal Opera House in Muscat. Our lovely resident seminary student and musician Laurel encouraged our group to join her at the Opera last week. The show: “The Fifteen top Classical Arab Songs”. My first thought: what will I wear? 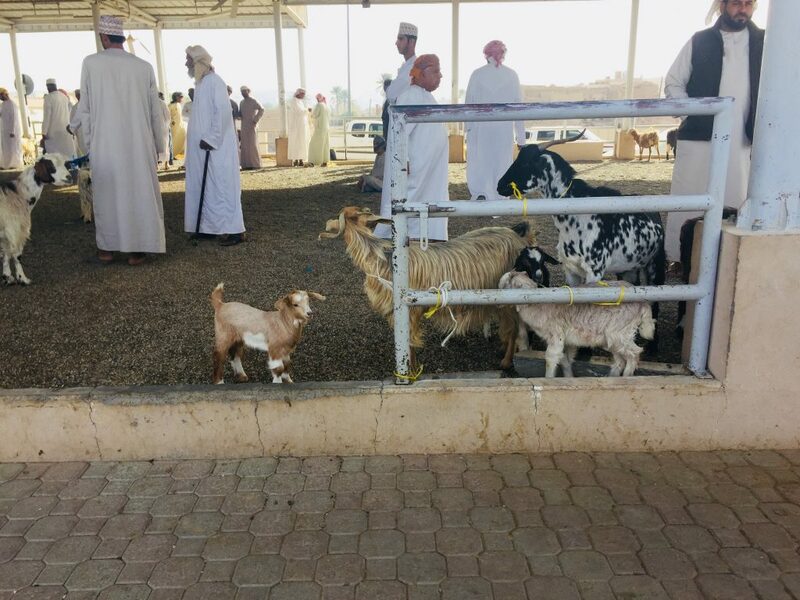 While the boys went shopping in the Souq and got fitted for dishdashas—the traditional menswear of Oman– my roommate Jessica and I ruffled through our stuff deciding what to wear. Jessica selected a gold caftan that she had bought the week prior and I pulled out a skirt, a cotton top and the fanciest scarf I had thrown in before I left. It would have to do. When we arrived at the Opera, we walked into the lobby and immediately were met with an architectural gem. From floor up, white and gold accented details danced until they reached a wood-paneled ceiling with hand-painted designs. Around us, men draped in spotless white dishdashas and topped with brightly wrapped Musalas strutted about as women’s skirts sashayed over their strappy high heels. The front of the theatre glittered as lights danced off long silver pipes. His Majesty Sultan Qaboos bin Said comes often to the Opera for organ concerts and the center of the space is devoted to the beloved instrument. In front of the organ on the stage were seats set for a full orchestra. We sat in our seats and waited watching people chatter and the ushers leading guests throughout the theatre. After a while, the lights dimmed and the concert began. The orchestra silently marched on stage, men in tuxedos and white bow ties and women in red and green garb with beautiful, gold headdresses. The conductor bowed and took his place. Then, the first singer, Jahida Wehbe arrived on stage in a stunning sheer green draped dress with gold accents. When she opened her mouth to sing, a stream of Arabic flowed out and she held notes I wish I knew how to reach. Drums deep and low set the undertones, the flutes twinkled their tunes, and the strings sang along. The singer performed with great control using her arms to gesture on the fast-paced Arabian journey. The woman next to me in her sparkling black and silver wrap was wiping her eyes during the lullabies and clapping along to the marching melodies. The audience’s attention and their hearts went especially for the next singer Ali Al Haggar as he went on in deep vibrato. Danny and Ben in looking Dishdashing in their Omani attire. Wearing the white dishdasha and scarf is the equivalent of a jacket and tie. Drums deep and low set the undertones, the flutes twinkled their tunes, and the strings sang along. What started as a one hundred thirty-minute show quickly became a three-hour event as Ali offered encore after encore. Women swung their gold bangled arms and cheered to the songs as the orchestra carried on. By the end of the night, I was exhausted, but the atmosphere kept my eyes wide. The traditional tunes are still much loved here, and I am so lucky I got to hear them from the best of the best: the Royal Oman Symphony Orchestra. 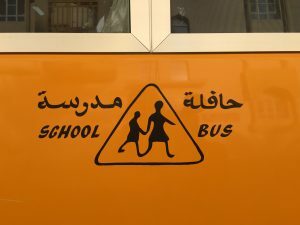 Check out the Opera site: https://www.rohmuscat.org.om/en and Ali Al Haggar (I couldn’t film during the show) here. Oman is a country with many kinds of people, pathways, and shops. What it does not have, however, is a social atmosphere that surrounds drinking, as it is illegal for alcohol to be sold within the state. I have, nonetheless become addicted to another substance: juice. Rather than asking a friend out to coffee like I would at Hope, I find myself asking “Juice anyone?” at least three or four times a day. 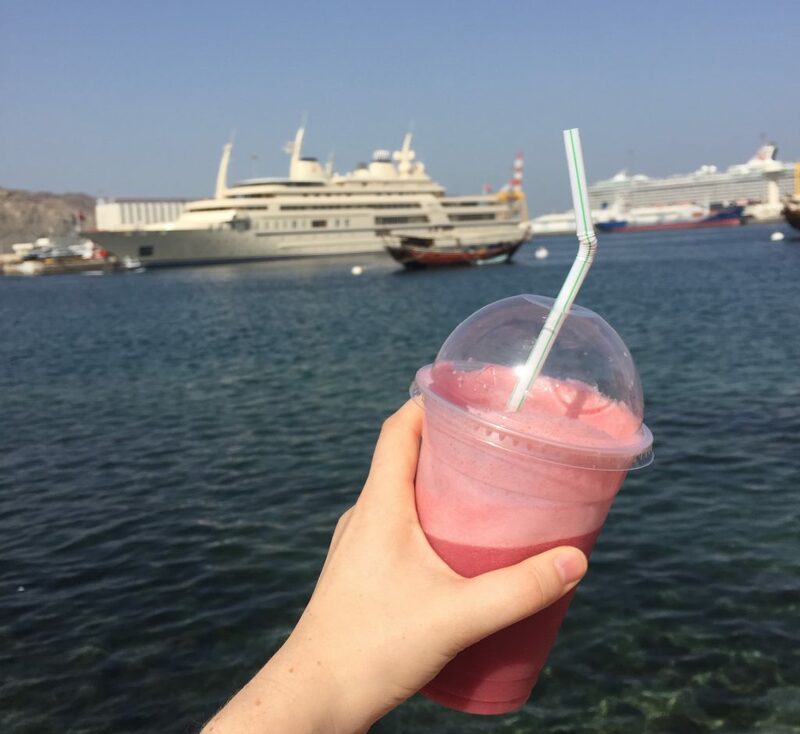 Pomegranate, kiwi, watermelon, banana, you name it, I’m pretty sure Oman has a juice for that! One of our favorite places to go for a quick bite of shawarma–a traditional sandwich made of chicken, lettuce, and sauce rolled up in a piece of naan or pita—has endless options of juice along with a meal. 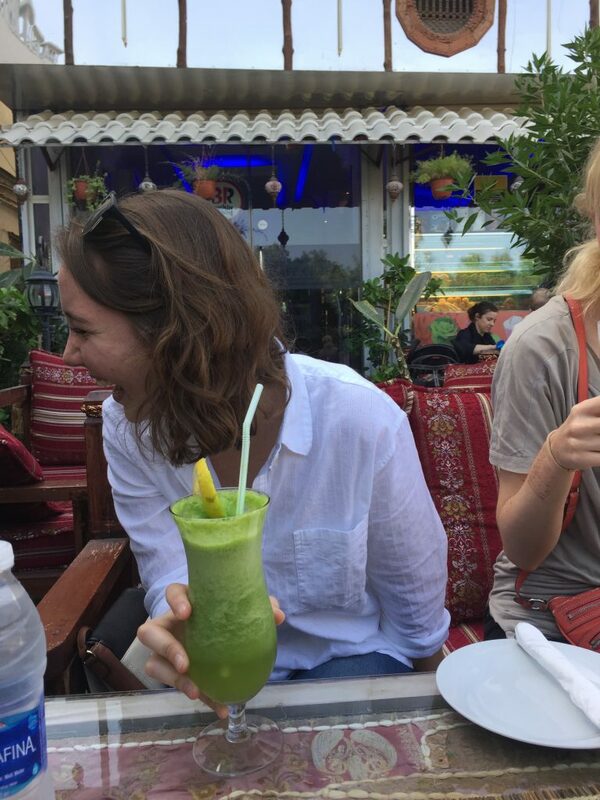 On our first night, I tried spicy lemon-mint juice and cannot get enough. As a result of returning for more, we have met the two men that run the restaurant and they have become quite accustomed to seeing our faces. 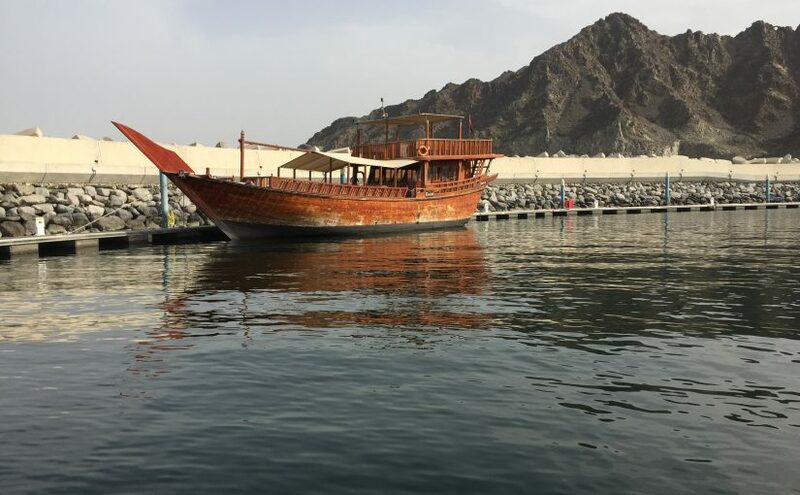 The shop is right on the harbor and next to the Souq – a large shopping market in Mutrah. While I sit and sip, it’s fun to watch taxi drivers greet incoming tourists coming off their cruise liners. One man continuously imitates Lionel Richie, “Hello! Is it me you’re looking for?” and shakes hands with visitors hoping to earn a few Rials (Omani currency). Stray cats run in and out of the Souq and seagulls scoop down into the water. The men at the shop are always smiling and as I slurp down the last of my juice, a small plate of dates always promptly arrives on the table. Wait a second, dates? Juice and dates? 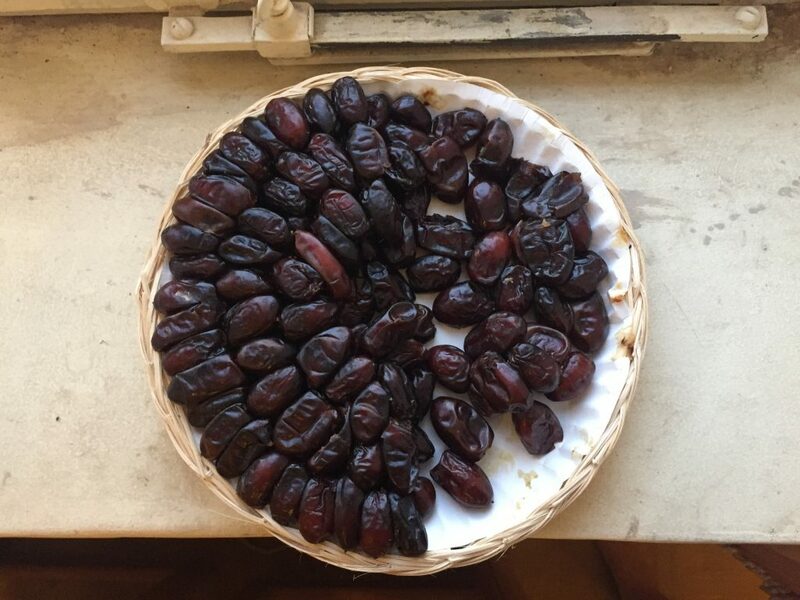 I’ve consumed more than enough dates just from being offered some by waiters, shop owners and on excursions throughout the city. Omani’s have given so many things to me from endless chai tea and samosas to sticky, honey smothered dates. The trickiest part is trying to eat the date with one hand – let me know when you master that one. By now the shop owners know me well and as a result, last Thursday I went home smiling with a plate of dates carefully wrapped up just for me. Before I left, I promised my new friends to return for juice and shawarma soon – a date I fully intend to keep.